A dark and ghastly tour through the mysterious past of downtown alleys and streets. Get haunted by after-dark tales of strange deaths, ruthless villains, the old red light district, famed ghosts, shocking assassins and more. 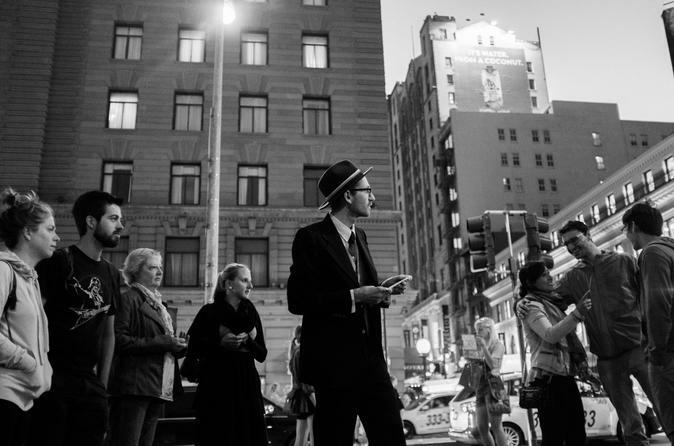 Meet your creepy storytelling guide near Union Square for this eerie tour. A ghostly and murderous tour through downtown. Get creeped out by after-dark tales of famed ghosts and paranormal activity, mysterious deaths, ruthless villains, the old red light district, shocking assassins and more. Meets near Union Square. Not recommended for children. From Union Square enter the St. Francis Hotel, famous for its past guests involved in politics, Hollywood and the arts, but infamous for a number of mysterious deaths. In the Tenderloin, hear how this neighborhood got its name, and see the site of the spectacular suicide that cast a dark glow over the neighborhood. Down the street, see where the Zodiac Killer picked up his final victim before disappearing forever. Around the corner was the notorious brothel run by madam Tessie Wall. And back on Powell Street, the Union Square Hotel has been a hotbed of paranormal accounts.